Your Kids Need YOU to allow them to GROW! How did LES PAUL's MOM change the world? 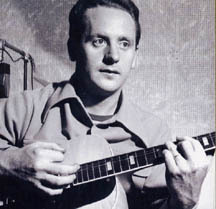 LES PAUL's mother showed unwavering faith in her child. She instincively knew that his curiosity was a good thing that should be nurtured. Just LOOK what she started! David: Do you think your mother and father had a big influence on the fact that youre so involved in music? LES: My mother I owe an awful lot to, because although she didnt force me to play the instrument, she encouraged me  in a very different way. We get a telephone in the house, and I looked at it, and next thing you know I got it all apart. I can remember: my brother is seven years older than me  so Ralph would say, "Hey Ma  kids got the phone apart in the living room!" and Mother would say, "Well, hell put it back together again. Its OK." I took the piano apart. I did a hysterectomy on that thing. And again, my mother says, "Dont worry about it, Ralph, hell put it back together again. Hes curious. He just wants to know." My brother  if it was a light switch - he threw it, and it went on, and that was the end of it. And I was different. I just wanted to know just what happened between turning that switch on the wall and the light comin on in the room. I wanted to know why. David: Did you get that piano put back together? I always looked at work as a privilege. So this is the way I approach things is: that how lucky I am at 87 years old that I can go to work, make people laugh, make people happy, and they in turn can make me healthy and happy. Its the greatest therapy in the world, is to be able to go to work, and enjoy your work. Now maybe if I was a plumber I couldnt grab my wife and say, "Hey - I want you to go over and see this connection I made. Or a butcher, saying, "Watch how I can take this cleaver and cut this meat". He may not have that kind of a relationship that he can share this with. But with the guitar - you can share this. With a person from China that doesnt speak a word of English. I never stop thinking about it. Have you already benefited from what we do? Write a REVIEW! Educating for tomorrow, to help children today. Every little bit helps! Please Donate what you can! Contact us to see how YOU can help!